On Sunday, Mark took me down to the Hagerman area and showed me all kinds of really cool stuff. I took over 200 photos and still didn't cover it all. This was absolutely the coolest trip I've been on in a long time, and the company was second to none. A lot of photos coming. I can't find the first place on the map, but it was like a sportsmen's access to Bell Rapids. Nothing rapid about it. Just a great spot. Then we walked down to the boat ramp and walked out to the end of it. The water was like glass, all was quiet except for a few birds, and about as serene as it could be. Driving out of there was this cool little spot. There were lots of birds in it, including a couple of blue heron few cormorants, and something being tentatively identified as Foster Terns (damn, Colleen ... I just looked them up. You're good!). From there, we headed south to the Hagerman Wildlife Management Area. There were quite a few nesting boxes around, but probably due to the time of day, we didn't see anything hanging out in them. Yes, those are pelicans. And the white/gray birds may be more of the Foster Terns (didn't pay attention), but what I loved looking at were the Cormorants. I'd never seen those before this trip, and there were quite a few of them around. Apparently, they eat a lot of fish and are not liked by fisherman. The WMA has a really cool fish hatchery. There were a ton of people over by it, and I couldn't imagine what was so interesting. Then I looked in to the run and saw giant fish. I put Mark's leg in this photo so it gives you some perspective. These fish were huge, but they were not nearly as large as they can and do get. Still, amazing to see. There was a tech there named Brandon who knew a lot of stuff and kept us well informed. He was a very pleasant young guy with an excellent career ahead of him. He has been working there for a year and really seemed to love it. I have a photo of him, but I'm in it, so it's not getting posted here. The area around the hatchery was gorgeous also. Here is Ousley Bridge crossing the Snake River as we headed to Hagerman Fossil Bed National Monument. The construction of this bridge reminds me of the bridge at Celebration Park. I believe it was built around the same time also, but will research that when I have some time. The view off the bridge heading east. From there, we drove the length of the Fossil Bed National Park or whatever, but didn't see much ... there was a self-guided foot path, but we decided it was too hot, and moved on. We did stop at one really nice spot before leaving the area. Another very empty, very serene spot. Further down the road a bit (and I'm going to guess a bit here as to our location), I think we were on the west side of the river from where Thousand Springs is. Here I found another woman who takes photos of the signs like I do to mark in her photos where the photos were taken. A good way to chronicle a trip. And here is where I first saw the weirdest thing. Poor Mark. This was one of a bazillion dumb questions I asked that day. He very patiently explained to me what an aquifer is and how it works. And I continued to shoot stupid questions at him. But I learned a ton. And I have some really cool stuff to research as soon as I have some time. I am really intrigued by the concept of the aquifer. From here, I think we went down through Buhl, opting for some munchies and decided to eat lunch later in Twin Falls. Mark wanted to show me where his band played several weeks ago. We headed up Clear Springs Road and made our way to Niagra Springs State Park. It would be impossible for me to pick a favorite spot on this trip, but if I was forced to, I would have to say that this was it. My photos do it no justice, although I had lots of fun taking them. And what a romantic spot. We were blown away that there was no one else here. There were a few turkey vultures to provide us with a bit of entertainment. Because I couldn't capture the color of the water at the falls, I took a photo of it downstream a bit. Some springs further down the road a bit. I loved this spot also. We are still in Niagra Springs area, and this was one of the few ponds that the water falls into. As we were standing on the dock checking out the fish, Mark says, "JODI LOOK!" I swung around with my camera, but wasn't quick enough. This water was unbelievably clear. Here my foot is in about 5 or 6 inches of water and there's not a speck of anything that you can see. I took tons of pelican photos. Again, I'll spare you. So we spent some time here just checking this out. There was a base jumper who jumped off the bridge while we were there, and within 20 seconds or so, he was on the ground, packed up his parachute into his backpack, and started the very very long trek back to wherever he came from. Amazing. 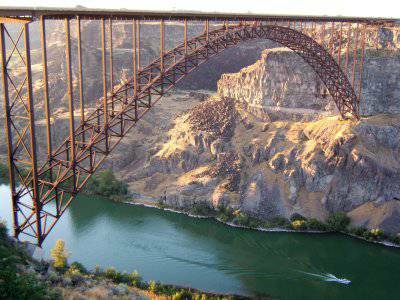 Small fact: Perrine Bridge is one of the only places in the United States where you can base jump without a permit. From there, we went to Shoshone Falls, something I've been dying to see since I moved up here. That big chunky guy was the most cooperative dude around. It's too bad I left my camera on the manual settings with the very low ISO because of the whitewater that I screwed up the bazillion photos I took of the rock chuck. This is the best one I could find. After we finished here, we drove the 1/2 mile or whatever it was up to Dierkes Lake. There were tons and tons of people up at the lake (we no longer wondered where everyone was). I was sweatin' like a pig and was hellbent on jumping in the water. Was about to hurl myself over a vat of children and adults, when we walked up the shoreline a little further and found a spot for me to jump in without hurting anyone. I didn't want to leave. I could have treaded water there for hours. But ... I reluctantly got out and we headed back to the car, and took a more scenic route home. Can you believe this all happened in one day? The night before, Mark played a gig and didn't get home till about 2:30 a.m. Imagine my surprise seeing him walk up to my deck at 6:30 a.m.!!! We were on the road by 7:30 a.m. and got home about 10:00 p.m. A gorgeous day, and one I won't soon forget! We'll probably stay the night in Winnemucca, head over to Lassen, and then probably off to the California / Oregon coast for a night and then head back home. I can't wait! Wow, what amazing scenery! Who knew there were so many waterfalls in your area. I love falls, I could spend hours just relaxing listening to their sound. Thanks for sharing! Absolutely stunning!!!! I've been to Idaho a couple of times (I was raised in Wyoming) but I've never seen this!!!! I would love to see it in person!!!! Thanks for sharing!!!! What can I say? WOWZZERRS!!!!!!! !BRILL!